This was a theme that restored the look of Firefox 3 to the Firefox 4 (or later) interface. It was based on the Windows ('winstripe') version of the Firefox 3 theme. 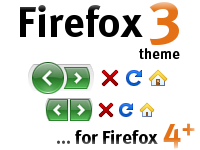 It is no longer being maintained as it has been superseded by Firefox 3 theme for SeaMonkey, and we recommend that you use SeaMonkey as your main browser if you are a power user and/or wish to keep having a Firefox 3-like experience when browsing. Some previews of the theme are shown below. Want to be able to customize the SeaMonkey GUI a bit more? Check out my MonkeyFix extension!